Canberra's new light rail network promised to "drive growth" and "generate vibrancy, diversity of employment and long-term sustainability". But business owners along the route say construction will leave them with bitter memories of near-crippling hardship. While construction of the 12-kilometre route is almost complete, the largest infrastructure project ever undertaken in the ACT has seen significant traffic delays and major road closures, along with the general noise and disturbance of a major construction project. Many business owners, particularly on the Gungahlin end of the new line, said the subsequent drop in foot traffic had seen turnover plummet. As a result, some businesses had sacked staff, sold properties or been forced to close their doors altogether. Unexpected difficulties, disruptionsSandra Nielson, who owns the Blind Dove Cafe on Flemington Road in Harrison, said the past two years had been far more difficult than she imagined. "We've experienced between 50 and 75 per cent loss in revenue," she said. "And I haven't had it the worst; there have been other people in the area that have suffered greatly." Ms Nielson's cafe sits not far from the Nullarbor Avenue stop — one of 13 along the route. But she said the construction had forced her family to re-assess their arrangements and lifestyle to keep the business afloat. "My husband had to go back to work full-time so we could survive," she said. "I know of other businesses closing, it's been a terrible impact on our area." Ms Nielson hoped turnover might turn around once passengers started pouring in and out of the tram. "I think it's going to have a positive impact on the area, but the last two years have been really, really tough," she said. Leo Mastoris runs a Greek takeaway shop just across Flemington Road, and said it was not hard to see why people had not been walking through the door. "People in Canberra choose to take the easier option, and people won't come down this way if [the road] is closed," he explained. 'Too big a risk'Nick Walshe, who opened the Runners Shop before light rail construction commenced, shared that sentiment. He said business was good and growing for the first few years, but began declining as the construction work began. Mr Walshe said word spread to simply avoid the area. "We've heard so many people that have said they've not been to Gungahlin town — these are people that live in Gungahlin — that haven't been here for months," he said. "People really did stay away for quite a long time." Mr Walshe said he would not have even opened the store if he had known how bad the past few years would be. "You would have to say, if you knew the construction was going to take two years, you'd say no," he said. "It's just too big a risk." As he watched businesses close on the street-front below his shop, Mr Walshe said the ACT Government could have done more to help and directed their money in better ways. "The philosophy of the Government is if they're going to spend money, they'll spend money on community consultation, on consultants to do an assessment on the impact on business," he said. "And that sort of thing, when you're a business trying to pay your rent, isn't all that helpful. "I'm happy that we've survived, and we've got the optimism of the tram up and running." The ACT Government is now preparing to embark on the next step in the light rail journey, with stage two to extend the line through the Parliamentary Triangle and on to Woden. Transport Minister Meegan Fitzharris said Capital Metro would look to improve in certain areas, including liaising with businesses. 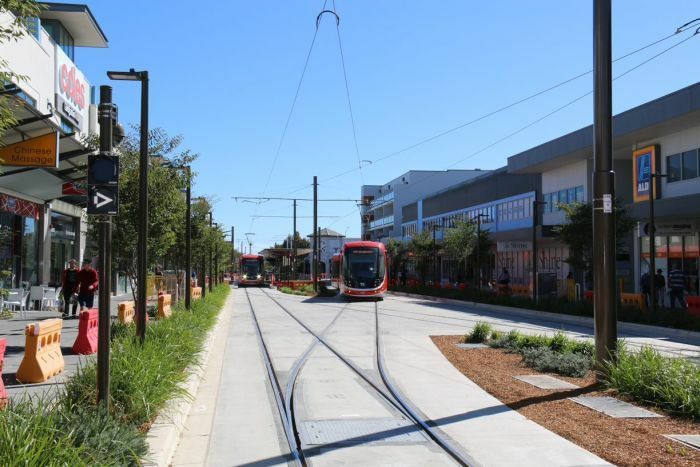 "We did some work last year around supporting Gungahlin businesses and lessons learned, we're very keen to apply those to all our work in our planning for stage two of light rail," she said. "We will start this year to really increase our engagement with businesses, particularly in the Woden town centre, about light rail coming to Woden. "And obviously check with businesses once light rail starts operating, what the change in customer patterns has been." Ms Fitzharris said there were a range of things the Government would look to do differently. "Clear communication, understanding of timelines, when there is going to be road closures — I think we can always look to improve those," she said.